Far more Americans say that the cost of the wars in Iraq and Afghanistan has contributed a great deal to the nation’s debt than say that about increased domestic spending or the tax cuts enacted over the past decade. 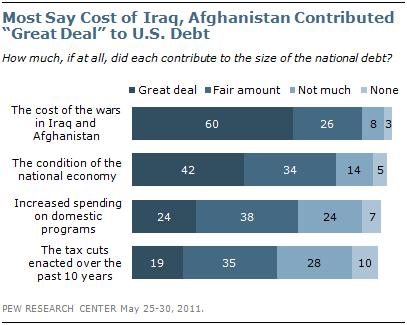 Six-in-ten (60%) say the cost of the wars in Iraq and Afghanistan has contributed a great deal to the size of the debt. About four-in-ten (42%) say the same about the condition of the national economy. By comparison, just 24% say increased spending on domestic programs has contributed greatly to the nation’s debt and even fewer (19%) cite the tax cuts enacted over the past decade. While half or more say spending and the tax cuts contributed at least a fair amount to the debt, 31% say increased domestic spending did little or nothing to increase the debt and 38% say the same about the tax cuts. 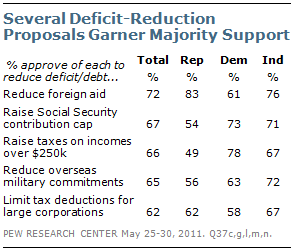 The latest national survey by the Pew Research Center for the People & the Press, conducted May 25-30 among 1,509 adults, finds widespread opposition to number of proposals aimed at reducing the deficit and the national debt, including reducing funding for the states for education and roads (73% disapprove) and gradually raising the Social Security retirement age (59%). However, several deficit-reduction proposals attract majority support, aside from the traditionally popular idea of reducing U.S. assistance to foreign countries (72% approve of this proposal. 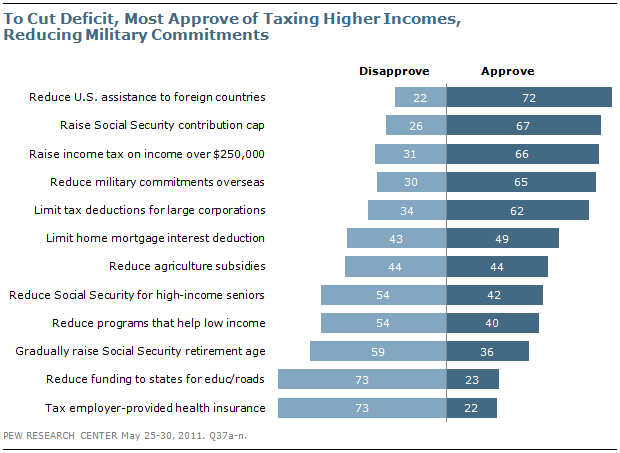 Two-thirds (67%) approve of making more of high earners’ income subject to Social Security tax, and nearly as many approve of raising taxes on incomes of over $250,000 (66%), reducing military commitments overseas (65%) and limiting tax deductions for large corporations (62%). Notably, Republicans (62% approve) are as likely as Democrats (58%) to approve of limiting corporate tax deductions; while 63% of Democrats approve of reducing foreign military commitments, 56% of Republicans agree. The survey finds that public concern about the budget deficit has increased since the end of last year. Currently, 28% cite the federal budget deficit as the economic issue that most worries them, up from 24% in March and 19% in December. Despite this shift, however, the job situation remains the broader concern – 38% say they worry most about jobs, up slightly from March (34%) though down from 47% in December. The partisan gap in deficit concern is wide: Republicans are about twice as likely as Democrats to cite the budget deficit as their biggest economic concern (37% vs. 19%). 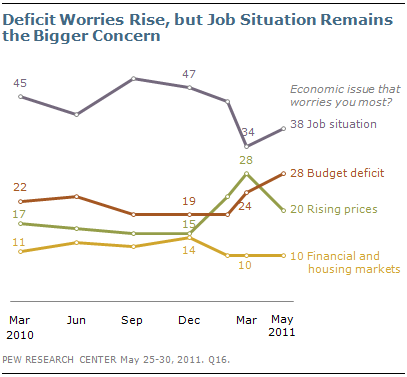 And the deficit has been rising as a concern among independents. Today, 32% say it is their top economic worry, up from 25% in March and 19% in February. 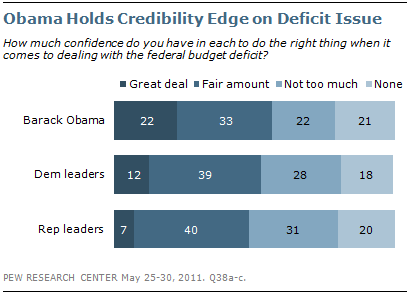 The public expresses more confidence in Barack Obama to deal with the budget deficit than either Democratic or Republican congressional leaders. About one-in five (22%) say they have a great deal of confidence in Obama on the deficit; 12% say the same about Democratic congressional leaders and 7% express a great deal of confidence in GOP congressional leaders on this issue. When asked which party can do a better job of reducing the deficit, 41% say the Republican Party and 38% say the Democrats. In early April, the Republican Party held a 46% to 34% lead as the party better able to reduce the budget deficit. The public remains persuaded that dealing with the federal budget deficit is critical. Roughly three-quarters (74%) say it is a major problem that the country must address now, while 22% say it is a major problem best addressed when the economy is better, and only 3% say it is not much of a problem. A number of specific proposals to deal with the deficit and debt receive majority support, particularly those that deal with reducing foreign commitments and making the wealthy and corporations pay more in taxes. Less popular are proposals that have a direct impact on middle-class Americans, such as taxing the value of employer-provided health care or gradually raising the age at which people can begin collecting Social Security. One particularly popular spending cut in the name of deficit reduction is to reduce U.S. assistance to foreign countries (72% approve). A substantial 65% also supports reducing U.S. military commitments overseas as a way to reduce the deficit. This comports with the broad impression – held by six-in-ten – that the cost of the wars in Iraq and Afghanistan has contributed greatly to the size of the current national debt, more than any other factor tested. Both of these reductions receive bipartisan support. Fully 83% of Republicans approve of cutting foreign aid to help reduce the deficit, as do 76% of independents and a more modest 61% of Democrats. Reducing military commitments overseas is favored by 56% of Republicans, 63% of Democrats, and a substantial 72% of independents. Two proposals that would take a larger share out of high-earners’ paychecks – raising income taxes on income over $250,000 and increasing the share of income that is subject to the Social Security payroll tax – are favored by roughly two-thirds of Americans (66% and 67%, respectively). 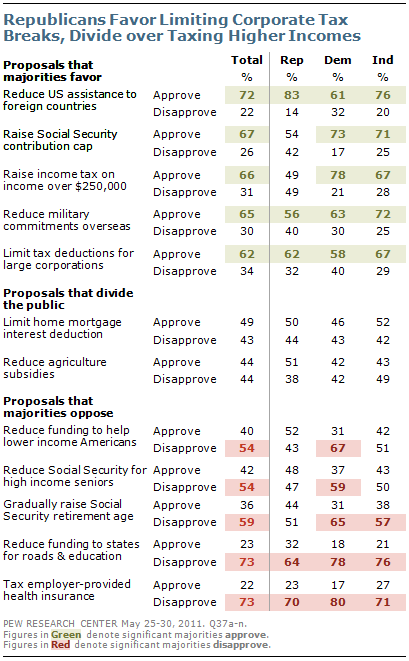 These are far-and-away the most popular approaches to deficit reduction among Democrats; 78% of whom support raising the income tax on high incomes, and 73% of whom support raising the cap on Social Security contributions. And while Republican leaders in Congress have drawn a firm line against raising income taxes, about half of Republicans nationwide (49%) would support higher taxes on income over $250,000 to reduce the national debt, and 54% approve of raising the Social Security contribution cap. By a 62% to 34% margin most people favor limiting tax deductions for large corporations as a means toward reducing the national debt. Two-thirds of independents (67%), as well as majorities of Republicans (62%) and Democrats (58%) support reining in corporate tax deductions. Of the 12 deficit reduction strategies tested, two are deeply unpopular, with disapproval outweighing approval by more than three-to-one. Taxing the health insurance people receive from their employers is opposed by 73% of Americans, including 70% of Republicans, 71% of independents, and 80% of Democrats. And 73% also oppose reducing the deficit by making cuts in federal funding to states for things like education and roads. Again, there is bipartisan agreement: 78% of Democrats, 76% of independents and 64% of Republicans oppose cutting federal funding to states for these kinds of programs. By much slimmer margins, most Americans oppose two often discussed changes to Social Security – gradually raising the retirement age (36% approve, 59% disapprove) and reducing benefits for high income seniors (42% approve, 54% disapprove). In both cases, Democrats are significantly more opposed than Republicans. By a 54% to 40% margin most Americans disapprove of reducing federal funding for programs that help lower-income Americans as a way to deal with the national debt. But this is one of the most divisive issues along partisan lines, as Democrats disapprove by more than two-to-one while Republicans and independents are more divided. When asked about limiting tax deductions for interest paid on home mortgages as a way to reduce the size of the national debt, the public is divided, with 49% approving and 43% disapproving. Last December, a similar question asked about eliminating tax deductions for home mortgage interest, and found a much more negative response: 56% disapproved of eliminating this deduction entirely, while 34% approved. 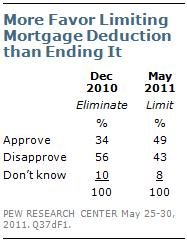 Eliminating the mortgage interest deduction was opposed across party lines last December. Today, Republicans, Democrats and independents are all divided, with roughly as many approving as disapproving of limiting these deductions. 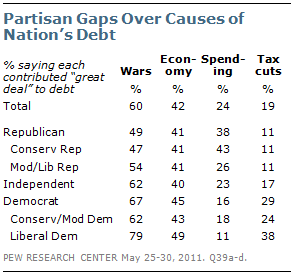 In terms of the factors that contributed to the nation’s debt, Democrats – especially liberal Democrats – and independents point to the cost of the wars in Iraq and Afghanistan as the biggest factor. Two-thirds of Democrats, including 79% of liberal Democrats, and 62% of independents say that the cost of the wars contributed a great deal to the debt. For both Democrats and independents, no other factor comes close to the wars’ price-tag. In fact, just 29% of Democrats, and 38% of liberals, say that the tax cuts enacted over the past 10 years contributed greatly to the debt. For Republicans as well, the cost of the wars (49%) is seen as a leading cause of the debt, along with the state of the economy (41%) and increased domestic spending (38%). Even conservative Republicans are about as likely to cite the cost of the wars (47%) as increased domestic spending (43%) as greatly contributing to the debt. Republicans are in agreement that the tax cuts are not a major factor in increasing the debt. Just 11% say the tax cuts have contributed a great deal to the debt, including identical percentages of conservative Republicans and moderate and liberal Republicans. However, most conservative Republicans (55%) say the tax cuts have contributed not much (31%) or not at all (24%) to the debt; fewer moderate and liberal Republicans (39%) say the tax cuts did little or nothing to increase the debt.